Our mission is to positively change children's lives by helping neighborhood residents to organize and establish an infrastructure providing long-term, accessible, academic support for the youth of its neighborhood through a robust after-school program, called Community Study Hall (CSH). Community Study Hall (CSH) includes tutoring, homework assistance, life skills workshops, field trips, library sessions, academic awards banquets, enrichment activities, and technology education programs, just to name a few. 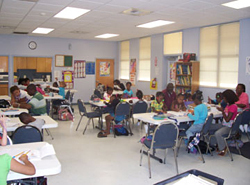 When fully implemented, Community Study Hall assists in the development of youths' skills, abilities, health, and overall character, through developing their abilities, limiting undesirable exposure, strengthening their preparedness for life, molding their character and motivating healthy behavior. 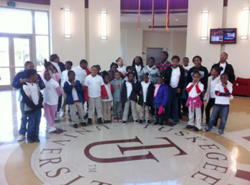 Canty CSH students at the Tuskegee University field trip. Our Vision is to have neighborhoods across the United States having flourishing Community Study Halls. Neighborhoods Focused On African-American Youth, Inc. (NFOAAY) is a non-profit, tax-exempt organization focused on positively changing the outcome of African-American youth. Cheryl Bursh, the NFOAAY founder, also co-founded the original Community Study Hall program, with an 85% college attendance rate (for those who participated from age 3 to 18) This model has been successfully being implemented for over twenty-five years.